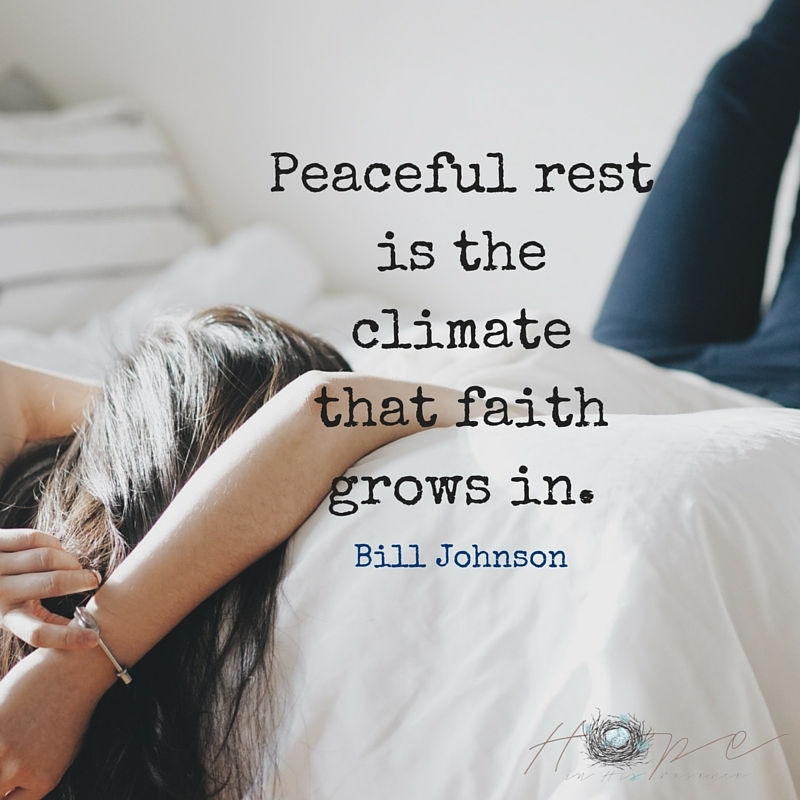 Peaceful rest is the climate that faith grows in. (See Hebrews 3:11-4:11) Bill Johnson, Spiritual Java. The world will tell you to hurry up and get it all done. The world reminds you to do it right now before time runs out. Before you miss your window of opportunity. The world screeches at you to take the easy way, every shortcut, whenever you can. The world urges you to do it if it feels right. The world teaches us selfishness is a positive trait you develop, how looking our for number one makes everything best, for you. The world speaks under the guise of the liar. God speaks without disguise from His very self, all wisdom, holiness and truth. Which voice are you listening to the most? The one who seeks to drown your faith in the busyness of selfish gain? Or the One who seeks to grow not only your faith, but your trust? The One who will shape you into the best you possible? The One whose arms are opened wide as as He proves His love for you in an intimate relationship meant to last forever? The One who offers rest for your soul, and walks with you through each step, each moment up ahead? We have the choice every day as to which voice we listen to. Our choice determines the growth of our faith. Holy Spirit, I want to grow in faith as You lead me closer to You. May I shut out the liar’s voice, and hone in on Your voice, at every opportunity. Let me rest completely in You, my source of peace and strength. May I walk out my days from the security of Your embrace. Beautiful blog! And such truth here. Like a breath of fresh air! Thank you.